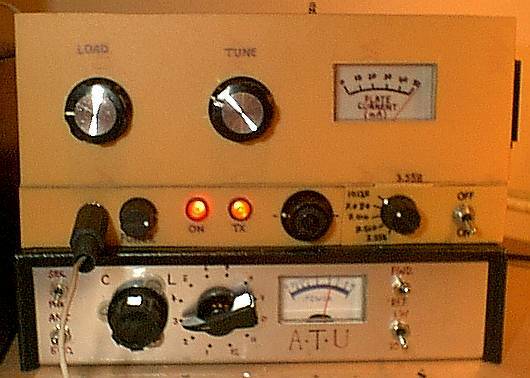 This page describes some simple modifications that were made to this transmitter to allow operation on the 30m and 20m amateur bands, and permit automatic CQ! 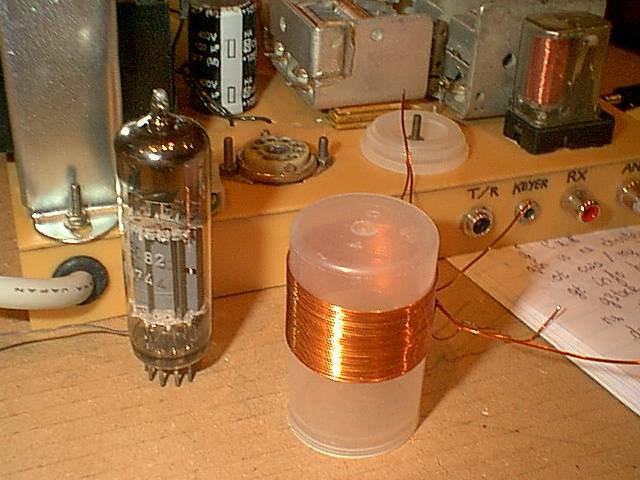 RELAYS: This photo shows the installed coil and relays. The large transparent relay in a socket on the right is the existing transmit/receive changeover. The two small relays next to the coil (black one underneath, white one on top) select 1 of the 4 taps according to the required band. A 12-way rotary switch on the front panel controls both the band-switching relays AND the crystal selecting relays. The specific combination of relays to activate in order to select the appropriate crystal AND the necessary pi-net coil tap, is controlled by a diode matrix (cheap 1N4148 diodes). UNDER THE CHASSIS: Under the chassis after the modifications. See the new 12-way rotary switch at botom left, 4 small white relays at top left select from up to 8 crystals. In this picture 5 crystals are installed: 3.558 (penned from 3.579), 3.560, 7.010 (penned from 7.030), 7.030 and 10.125. I later added another two crystals: 10.106 and 14.060. 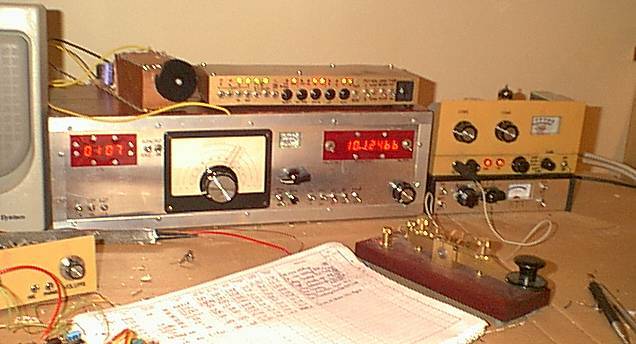 In the background, my 80/40m RX with frequency counter and audio piped from my 30m direct conversion receiver front end. NEW LOOK: New look front panel. At bottom left, there used to be 3 toggle switches: power, 80/40m, and the crystal selector within band e.g. 3.558 vs 3.560. The 2 crystal selecting switches were replaced by a 12-way rotary switch. I had to cut out that old section of the PCB-material front panel, and replace it with an uncut section for drilling the new holes (2 instead of 3). Despite the patchwork it still looks Ok. The labelling shows the 5 crystal frequencies. The old "3.558" above the knob is the old toggle switch label, there it stays until I decide what to do with it. The usual nail varnish remover won't take off this indelible ink, after it soaks slightly into the board. The board after all is only a kind of compressed paper (SRPB not fibre glass PCB). QRV ON 30M! : Transmitting on the 10.125 crystal. Under the TX, is my homebrew ATU. Plate current is a little over 50mA indicated, for a power output of over 4W. For a 30m receiver, I used my simple 30m direct conversion receiver front end, with my usual 80/40m RX providing audio filtering and audio power amplifier. 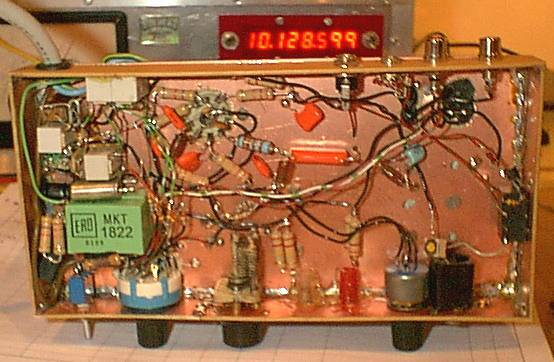 The transmitter also tunes fine on 20m using a 14.060 MHz QRP calling frequency crystal. Power output is estimated at about 1.5 - 2 Watts. 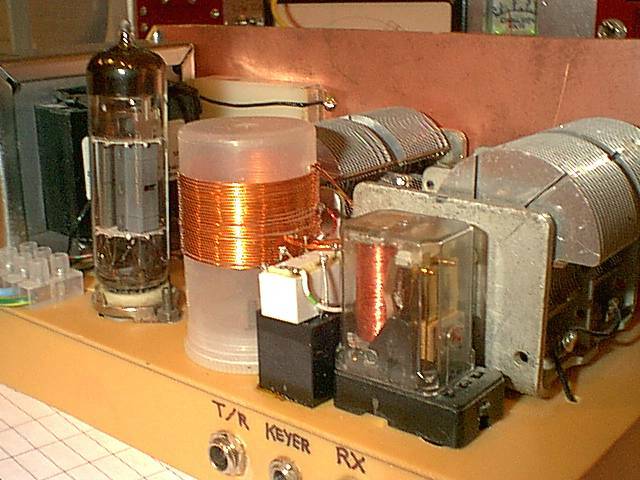 However at the time of writing I lack a receiver capable of operating on the 20m band so the transmitter has yet to be tested on air using this band. CQ MACHINE! : Look, no hands on the key! 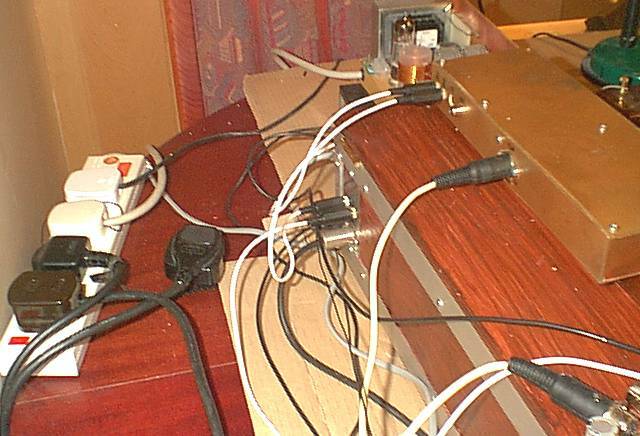 I modified my 30m QRSS beacon (seen here on top of the receiver cabinet) to operate as a keyer with the internal 250mW 30m transmitter switched off. It outputs two signals, one to control the RX/TX relay, and one to control a new keying relay in the TX. I programmed the message using the front panel switches on the beacon controller. That's 1024 memory locations individually programmed with the buttons and switches, very tedious. The message is in 12wpm: CQ CQ CQ DE G0UPL G0UPL G0UPL CQ CQ CQ DE G0UPL G0UPL G0UPL K after which there is a pause of 30 seconds or so during which the rig is switched to receive, then the sequence repeats. This automatic CQ'ing machine really makes it a pleasure to call CQ! CROWDED! : Behind the rig, it's getting crowded now with all the cables connecting the 30m receiver, the QRSS beacon controller, PSU, 80/40m RX and ECL82 TX.